Comfort and protection, the Vice 2.0 glove benefits from a McFit® liner and finger expansion panels. Grade A goatskin backhand and palm offer abrasion resistance while the TPU molded polyurethane knuckle with a stainless steel guard protects against impact. • Grade A goatskin backhand short-cut gauntlet and fourchettes. • Abrasion-resistant goatskin palm with a TPU palm protector pad and integrated wrist protection. • McFit® technology liner offers maximum comfort and fit. • Molded polyurethane knuckle protector with a stainless steel guard for ultimate protection against abrasion. • TPR molded polyurethane finger protection with finger expansion panels to help reduce hand fatigue and improve dexterity. 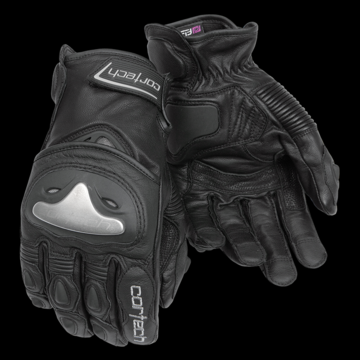 • Outer seam stitched palm and fingers maximize glove comfort and function. • Vent on the backhand helps cool the hand while riding. • TPR hook and loop wrist closure. Cortech designs and manufactures the finest high-value performance motorcycle apparel, luggage, and gear. We also offer performance snowmobile gear too. Copyright © 2019 Cortech Performance Motorcycle Gear & Helmet House Inc- All rights reserved.